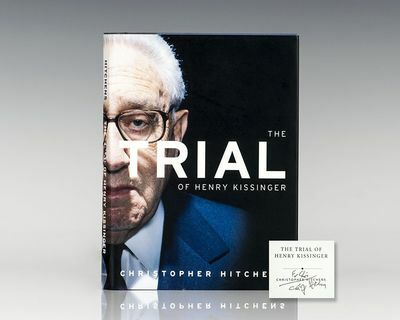 viaLibri ~ The Trial of Henry Kissinger. London & New York: Verso, 2001. First edition of this polemic by Hitchens. Octavo, original half cloth. Inscribed by Christopher Hitchens on the title page. Fine in a fine dust jacket. "Hitchens is a brilliant polemicist and a tireless reporter. Both sets of skills are on display throughout this book as he presents damning documentary evidence against Kissinger in case after case" (San Francisco Chronicle).